Government plans for a £3,000 "security bond" for some visitors to the UK have been criticised as discouraging inward investment. The move could see fewer firms investing in the UK, said the UK-based National Asian Business Association. "Suddenly we've become a fortress Britain," said chairman Uday Dholakia. However, the Home Office said the scheme would be "highly selective" and not applied to all visitors. The aim of the scheme, which will be piloted in November, is to reduce the number of people from some "high risk" countries staying in the UK once their short-term visas have expired. The money is forfeited if the visitor does not leave on time. Although it has yet to be confirmed, it has been reported the bond will apply to those from India, Pakistan, Bangladesh, Sri Lanka, Nigeria and Ghana. This week, Business Secretary Vince Cable criticised the plans, saying it was wrong to set the bond at £3,000, and called for a more "sensible and flexible" approach. When the plan was announced earlier this year, Indian business leaders called it "highly discriminatory" and said it would risk undermining Anglo-Indian relations. But British Asian business leaders are also warning of the possible economic consequences. The National Asian Business Association said the move could see fewer small and medium-sized south Asian companies bringing their business to the UK. "This government plan sends out a signal that we are anti-enterprise, we are anti-inward investment," chairman Uday Dholakia told the BBC's Asian Network. "And that is a detriment to our challenge as a country to attract businesses specifically from the sub-continent." A number of organisations that represent British Indians in the UK have said they are concerned that the bonds will make it more difficult for family from overseas to visit. 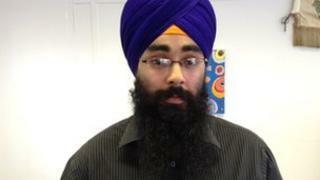 Kartar Singh Bring, vice chair of Leicester Sikh Alliance, said cost would be a major factor for many people. "Many who're from poorer, rural families were saying we couldn't possibly afford that kind of money. "It places an undue amount of financial burden on them. Many feel guilty, assumed to be high-risk citizens because of the country they're from." Hemendra Mistry of the Gujarat Hindu Association, based in Leicester, said that for the government to classify India as "high risk", was "an insult to everybody in the community here". "The bond will restrict a lot of Indian family members who want to visit for weddings and births," he said. "This move will stop them coming to the UK. Is that what the government wants?" Meanwhile, one British Indian lawyer, Sarosh Zaiwalla, said there could be a case for racial discrimination against the cash bonds. "There is an arguable case to challenge the visa bond requirements for Indian visa applicants before the European Court of Human Rights in Strasbourg," he said. "The EU law is very clear. You can't discriminate on grounds of nationality, race, religion or colour. This is a clear case of discrimination on the basis of race and country." The Home Office has said that the pilot scheme later this year would test the impact of taking financial bonds from a small number of visitor visa applicants. In a statement, the Home Office told the BBC that the scheme would be "highly selective, applying bonds on the basis of risk, rather than to all visitors from specific countries". For more on this story, listen to BBC Asian Network on 13 September at 13:00 and 17:00 BST.